Geeta Jayanti is the birthday of the Bhagavad Geeta – the day Lord Krishna gave this immortal message to Arjuna on the battlefield of Kurukshetra. This year, Geeta Jayanti falls on 13th December 2013. Every year, Geeta Ashram Malaysia celebrates Geeta Jayanti by having an 18 – day programme, with one chapter of the Geeta being recited every day, followed by a discourse on that chapter. During this time of the year, the youth help out by ensuring that the Geeta verses and lyrics to the bhajans and aartis are up on the projector so that every devotee is able to follow the satsang. Our younger children take turns to lead in the recitation of chapter 12 and also of our Krishna Aarti at the end of the satsang. Additionally, older children of the ashram also participate by giving the discourse on a particular chapter for some of the days. Do join us for Janmashtmi this year at GA Malaysia @ Petaling Jaya! Except Sundays 11am – 1pm followed by lunch. 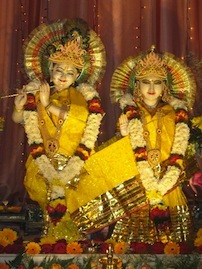 For more information on our Geeta Jayanti Celebrations, click here!